Drawing by the Pound! : Challenge: 52 Pounds of Drawings/ Reto: 52 Libras de Dibujo. Challenge: 52 Pounds of Drawings/ Reto: 52 Libras de Dibujo. 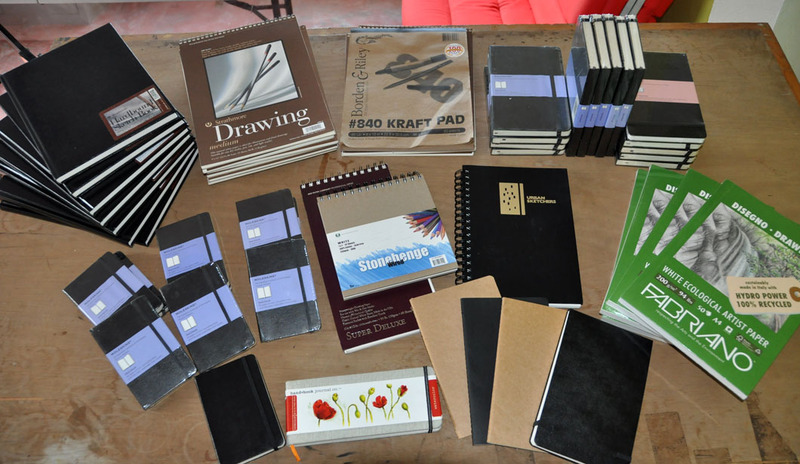 Challenge: 52 Sketchbooks/Journals to be fill up during 2011. Reto: 52 Libretas de Dibujo/Diarios Visuales a ser completadas en el 2011. I've been doing the classical "end of the year" clean up, de-cluttering and throwing stuff away. In the process I piled up a bunch of sketchbooks. I love sketchbooks, every time I travel I buy tons of them (or friends give them to me as gifts) since I don't find the ones I like in Dominican Republic. After many travels I have ended up with 55+ of them UNUSED! So here's the deal: I will challenge myself to fill them all during 2011. Some people will say: "I fill them all in a month"(good for you); others will say: "Are you nuts? Those are too many...". Every person has its own pace and that is totally fine. I choose to go with one per week (that is a challenge for me considering I still have to report to a "40 hours a week" job). Challenge: 52 pounds of Drawings. 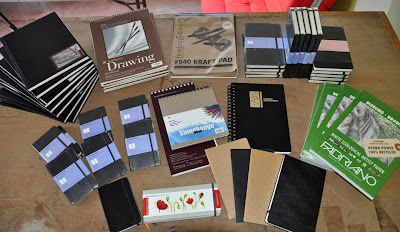 52 weeks = 52 sketchbooks/journals, one per week and let's see what happens. I will just let it flow and will not limit it to just drawing from observation, I will go ahead and fill them with ideas for projects, urban sketches, reportage drawings and even doodles if I feel like it. It is, after all, just a sketchbook... a place to file ideas, to experiment and, last but not least, to have fun and learn something about myself in the process. Here we go. Let's do this!!!! Do you want to join me? I'll be back in a week with my first sketchbook filled! Happy and challenging 2011. Let's get out of our comfort zone. Let's go!!!! En estos días he estado haciendo la clásica "limpieza de fin de año", despejando los rincones y tirando cosas a la basura. En el proceso he ido acumulando libretas de dibujo. Me encantan las libretas de bocetos, en cada viaje compro un montón de las mismas (o me las regalan los amigos) ya que en Rep. Dom. no encuentro las que me gustan a mí. Después de tantos viajes he acumulado más de 55 libretas aún SIN USAR! Así pues, este es el trato: me retaré a llenarlas todas durante este 2011. Algunas personas dirán: "Yo las lleno todas en un mes" (bien por ti); otras dirán: "¿Estás loca? Eso es demasiado...". Cada persona tiene su ritmo y eso esta bien. Yo escojo llenar una a la semana (eso de por si ya es un reto para mi considerando que tengo que reportarme a un trabajo de ocho horas diarias). Reto: 52 Libras de Dibujo. 52 semanas = 52 libretas de dibujo, uno por semana y vamos a ver que pasa. Yo simplemente lo voy a dejar fluir y no me limitaré a solo dibujos de observación, voy a proceder por igual a llenarlo con ideas para proyectos, dibujos urbanos, reportajes visuales e incluso garabatos si así lo siento. Es, después de todo, solo una libreta de dibujo... un lugar donde plasmar ideas, experimentar y, por último pero no menos importante, para divertirme y aprender algo sobre mi en el proceso. Regreso en una semana por aquí, con mi primera libreta de bocetos completada! Gracias. Feliz y retante 2011! A salir de la zona cómoda ya. Vamo' arriba....!!!! Orling "Arty" Domínguez... drawing by the pound! Buehhhhh pues yo tambien me uno, lo unico que tal vez con un sketchbook menos pues comienzo tarde. Anyways, yo tambien ando envuelta en un proyecto para salir de mi "comfort zone"